Download AISBackup: Managed backup utility software for Windows PC and Windows Servers. If you would like to be informed when an update is available please follow AISBackup on Twitter. To enable SSL security with FTP backup jobs and secure e-mail, for example with Google Gmail, download and install the SSL support files here. AISBackup supports the making of a Restore Media on CD, DVD, USB Flash drives and External hard drives. New Users may try AISBackup for 30 days. Upgrading to version 5.2 (488) is recommended for all existing users of AISBackup as there are improvements for all Windows client and server operating systems (From Windows 95 to Windows 10 and Windows NT4 Server to Server 2012R2). Many AISBackup updates are suggested by our users, use the message forum to add your own suggestions. 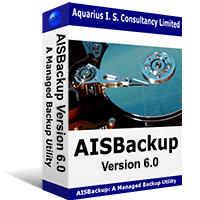 AISBackup supports 32 bit and 64 bit Windows 7, Windows 8, Windows 10, Windows Vista, Windows XP and Windows Server backup for individual files and folders and Windows disaster recovery. If you like AISBackup, please submit a review to c|net. There are no beta or pre-release versions of AISBackup available. Do you want a new feature? Place your idea on the AISBackup feature request forum. The installation program will fail to complete if the installation file is not complete, please check to see if the downloaded file is 4.99 MB (5,234,192 bytes) bytes if you encounter a problem. If so delete the downloaded version of aisbi486.exe before trying again. For step by step installation instructions click here. Install AISBackup over the top of the existing copy, this will not change the current registration properties. If you need help with using AISBackup see the help videos here. Unless otherwise stated these instructions work with: 32-bit and 64-bit versions of Windows XP, Windows Server 2003, Windows Vista, Windows Server 2008, Windows 7, Windows 8, Windows 10, Windows 2000, Windows Server 2000, 2003, 2008, 2012 2016 and Windows NT4. Copying the Windows 10 Operating System and Other Partitions to a New GPT Formatted Disk on a PC That Boots Using UEFI. In this scenario a 1TB disk drive is to be replaced by a 6TB disk drive. The source disk contains the EFI boot partition, a Windows recovery partition, the 'C:' drive that contains the Windows 10 Operating System, a BACKUP partition and a DATA partition. This guide will help with upgrading or replacing disks in modern UEFI booting laptops and PCs. Click to Download the PDF Guide. This guide explains step-by-step how to make a backup of your PC suitable for disaster recovery and ad-hoc restoring of documents etc. The guide also shows you how to make the AISBackup bootable recovery CD, bootable USB external drive or bootable USB flash drive. The guide also shows you how to make a single backup job backup to multiple external drives to facilitate on-site and off-site backups. This guide explains step-by-step how restore your PC following a disaster or if requested to during a normal restore. The restore media provides a much better solution to doing the equivalent a factory reset on your PC as the restore will be based on a more recent copy of your PC's files than a factory reset will provide (after all your pictures, music and documents were not already on your PC when you purchased it). This guide also shows you how to use the advanced options of the restore media, for example changing drive letter assignments, editing the registry. Instructions on how to make the restore media are shown in the PC backup to disk.... guide, above..
How to backup Windows from a MBR disk and restore it to an EFI booting GPT disk. This guide takes you set-by-step backing up Windows 8.1, creating the AISBackup bootable restore CD or bootable USB flash drive and then restoring Windows to a 4 terabyte disk drive. In order to use the full 4TB the disk must be formatted using GPT instead of MBR and in this example we make the disk (U)EFI bootable. Please note that EFI booting is only possible on 64-bit versions of Windows. This procedure will not work for 64-bit Windows XP or 64-bit Windows Server 2003. Indeed, Windows XP cannot access GPT disks in any case. This guide shows you step-by-step how to take a backup from a Windows XP computer and restore the documents, favourites, e-mail, address book and AISBackup registration key file to a Windows 7 PC or Windows Vista PC. The guide shows you how to import Outlook Express e-mail into the replacement Windows Mail program. These instructions will also work with backups made on Windows 95, 98, 98SE and Windows ME. Click to Download PDF Guide. This guide explains step-by-step how to make a restore of your PC using a Windows 7 or Windows Vista set-up DVD. Use this option if you did not make the disaster recovery media (CD, DVD, flash drive or external drive). This guide explains step-by-step how to repair the Windows boot menu and covers dual booting Windows 7 or Windows Vista and Windows XP. Please note that the guide is also suitable for the Windows Server operating system's.